You can add comments to your script in a similar fasion to C languages. linemode = 0 (sl); // You can also use single line comments. 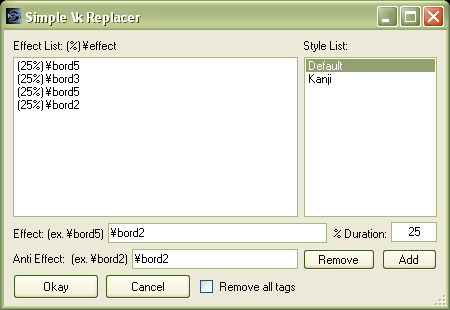 The following wizard allows for easily replacing \k tags with effects. Basically you add effects along with a percentage value. So in the above image it will increase the border to 5, then decrease it to 3, then increase it to 5 again, and finally decrease it to 2 which is also the anti effect border value. Each effect will be applied in order for the percentage specified. If no anti effect is specified it will default to "\r". If the "Remove all tags" checkbox is checked, all non \k tags will be removed from the loaded file. This effect will be applied to all styles selected in the "Style list". If no styles are selected, then it will apply it to all styles.